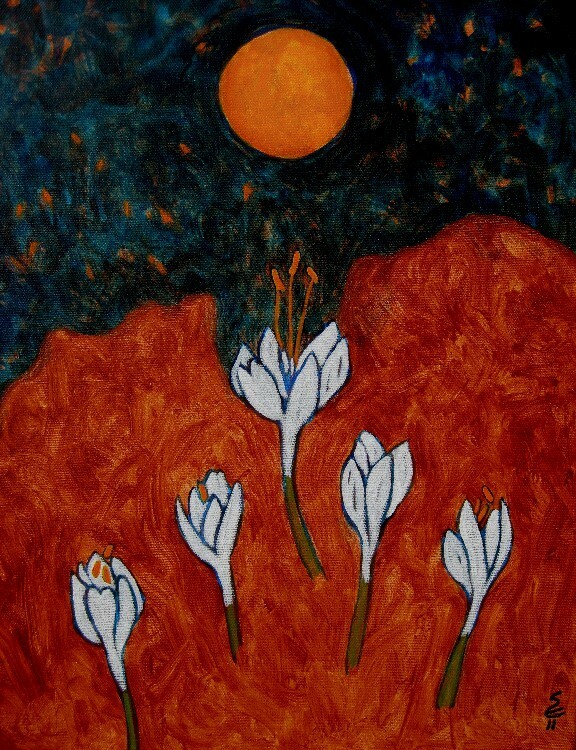 Dance of Spring's Eve, Acrylic on Canvas, 18" x 14"
It is surely, absolutely, finally, and most wonderfully S P R I N G! Stravinsky & The Riotous Spring, Acrylic on Canvas, 18" x 14"
Igor Stravinsky was a wild, brilliant composer. Vaslav Nijinsky was a visionary dancer/choreographer. Serge Diaghilev was Diaghilev, the 'mad for beauty' man, the founder of Ballets Russes. 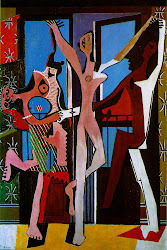 Diaghilev would bring these two together for the ballet called Le Sacre du Printemps / Rite of Spring. It would premiere on 29 May 1913 in Paris at the Theatre des Champs-Elysees. During Act I, the audience started shouting - those who hated it, against those who liked it. There were fist fights in the aisles. The crowd was so noisy that the dancers couldn't hear the music. Nijinsky called out the beats. The police were called in. By the end of Act III, there was a riot. Stravinsky would claim it was because of his music. The aggressive dissonances and complex rhythmic patterns were too new for many. 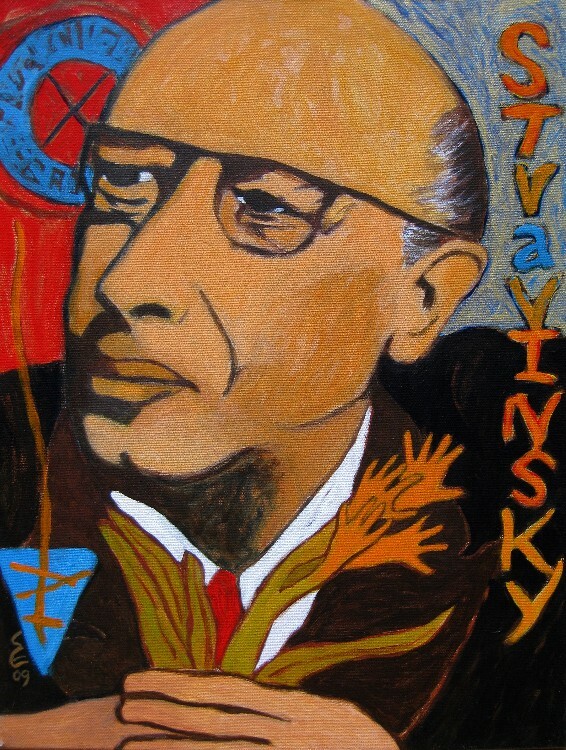 The Rite of Spring would make Stravinsky internationally famous. He is now considered one of the most influential composers of the 20th Century. Nijinsky's choreography was considered the real cause of the riot. This choreography was something that had never been experienced before. He used turn-in positions instead of Classical Ballet's turn-out stances. It was angular, rather than rounded. The main focus of dancing was from the core of the body, instead of the usual emphasis on the dancer's feet and legs. And it broke all tradition by yearning for the earth instead of the sky. Many in the audience were appalled. They did not realize that they were witnessing the foundations for the beginning of Modern Dance. Diaghilev was very pleased with the entire event! 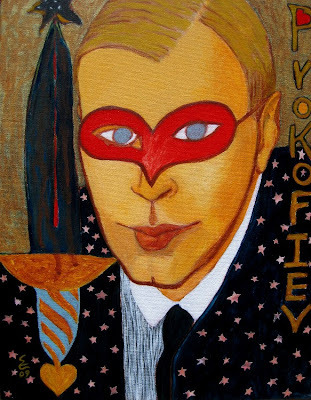 This portrait concludes my "Russian Icon Trilogy: Tchaikovsky, Prokofiev, & Stravinsky"
Prokofiev & The Star-Crossed Lovers, Acrylic/collage on Canvas, 18" x 14"
Sergei Prokofiev is the second portrait from my "Russian Icon" series. His biography could have been a Tolstoy novel, a life full of starts and stops, as the world intervened. His music was new, modernist, full of dissonant harmonies and strange time signatures. It perfectly mirrored the times he lived in: World War I, The Russian Revolution, Stalin's Reign of Terror, & World War II. His death would be no different than the odd circumstances of much of his life. He would die in Moscow, on the same day that Stalin's death was announced to the Soviet Union. There would be no flowers available for his funeral and the music played would be on tape. The piece chosen was his "Funeral March" from the Ballet, "Romeo & Juliet". Almost everyone knows his "Dance of the Knights" from "Romeo & Juliet". One of my absolute favorite musical pieces is his "Balcony Scene" from the same ballet. 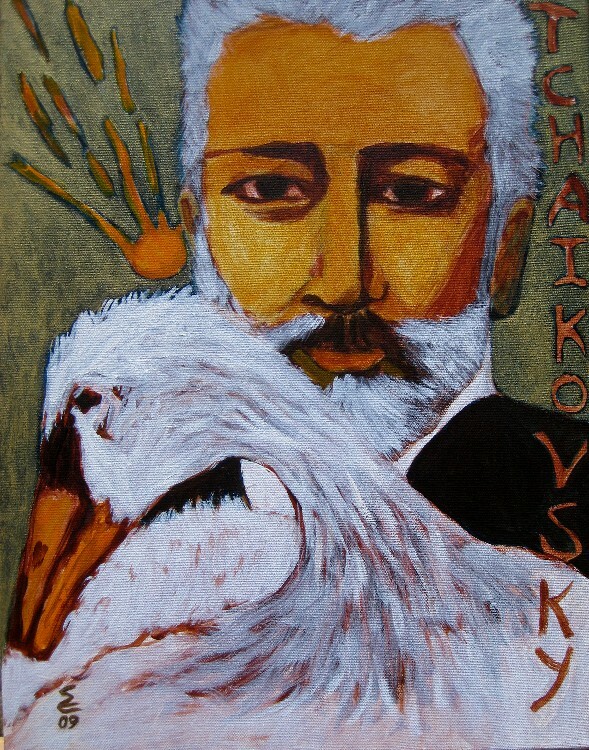 Tchaikovsky & The Winged Messenger, Acrylic on Canvas, 18" x 14"
I adore the music Tchaikovsky created. I paint to it. I dream with it. I cherish it. I get lost in his lyrical melodies and dramatic harmonies: the sublime moments of joy and the profound moments of heartbreaking longing and despair. He was an innovative composer. His music pleased few. He was considered too modern for the West and too Western for Russia. When Swan Lake was premiered it was not well received. He was attacked for wasting his talent by composing music for the ballet. He would go on to compose the music for The Sleeping Beauty and The Nutcracker. He would prove his critics wrong. He was hated & loved, loved & hated, & loved again. He created 6 Symphonies, 7 for those who count Manfred; 10 Operas, including Eugene Onegin and Pique Dame; 3 Ballets; Orchestral Suites; Works for Orchestra, including Serenade in C for String Orchestra, The 1812 Overture, and The Tempest; Solo & Chamber Music, including The Seasons and Souvenir d'un Lieu Cher; and Concerti & Concert Pieces, including Piano Concerto No.1 in B flat minor, and Violin Concerto in D major. He created a world full of beautiful gifts. One of my favorite pieces: Tchaikovsky, Swan Lake, Act 1, Waltz. *The Tchaikovsky quote above: from a letter to Nadezhda von Meck on 23 Nov/5 Dec 1877. "The Life & Letters of Peter Ilich Tchaikovsky" by Rosa Newmarch (c) 1905 reprinted 2004. The quote info was found at http://www.tchaikovsky-research.net/ a fantastic place for all things Tchaikovsky.